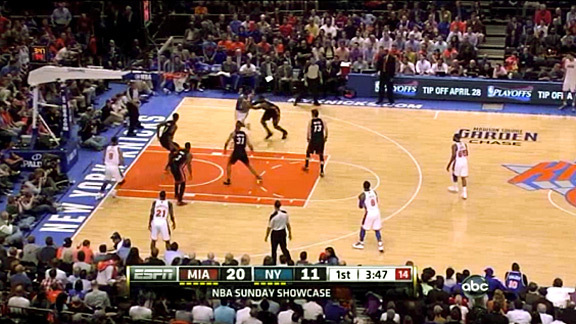 Watching the New York Knicks play the Miami Heat is an interesting clash in styles. Since Mike Woodson took over as the Knicks’ coach — especially since Amar’e Stoudemire and Jeremy Lin went down with injuries — his team has relied largely on isolation plays, usually for Carmelo Anthony. The Heat have the league’s best defense when it comes to defending isolation offense. Their 0.709 points allowed per possession in these situations is the NBA’s best, and opposing teams shoot just 33 percent when they try to go one-on-one against Miami. One reason why Miami is so tough on defense is that they have LeBron James, who allows just 0.574 points per possession (PPP) when opponents isolate against him. Knowing this, it was surprising to see Anthony go off against Miami using simple isolation plays throughout the game’s first three quarters. He scored 21 points on 15 isolation possessions until the fourth quarter, according to Synergy Sports. He scored effectively against both James and Shane Battier. So why couldn’t Miami stop him? 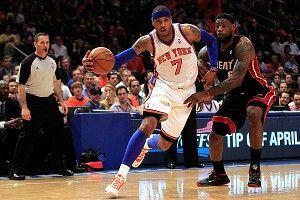 After breaking down some tape, it seems like the Heat failed to execute their game plan against Anthony. 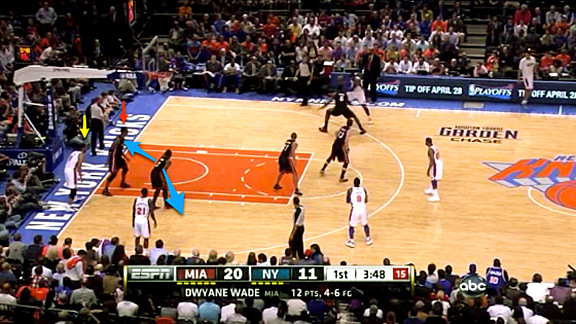 Miami’s strategy against Anthony is to force him baseline and hopefully into a second defender. 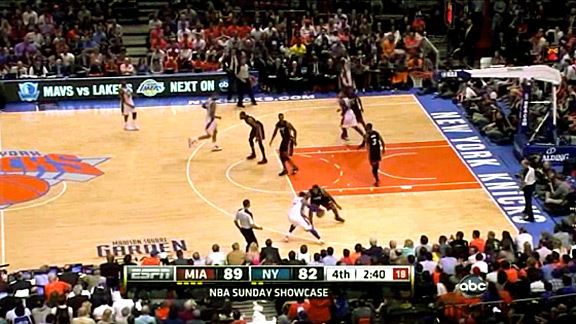 In this play, as Anthony catches the ball, James positions his body to cover the middle and send Anthony to the baseline. 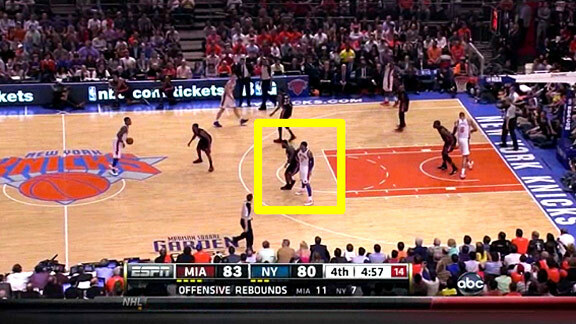 James even points toward the baseline to let Chris Bosh know that he is forcing Anthony there. As Anthony starts his drive, James rides his left shoulder to ensure that Anthony can’t go back to the middle. 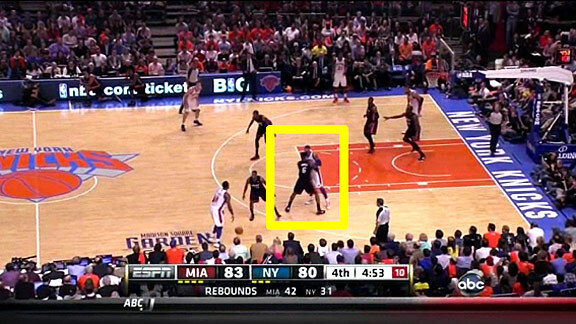 Bosh provides help as Udonis Haslem rotates to the middle to cover Bosh’s man. So far, the execution looks perfect. Sometimes, though, good offense beats good defense, and that’s what happens here. Anthony pulls up and hits the jump shot before Bosh can help. On this possession, Bosh is in the right spot to provide help, but Anthony pulls up for the jumper and leans into James’s body to prevent him from blocking his shot from behind. 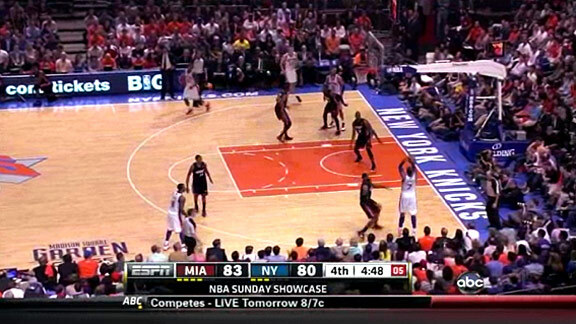 If Anthony took shots like this for the entire game and knocked them down, I’m sure Miami would accept it. In the following possessions, however, the baseline help arrived late or didn’t come at all, and Anthony found easy lanes to the rim. On this possession, Anthony catches the ball on the wing. Again, James forces him baseline. 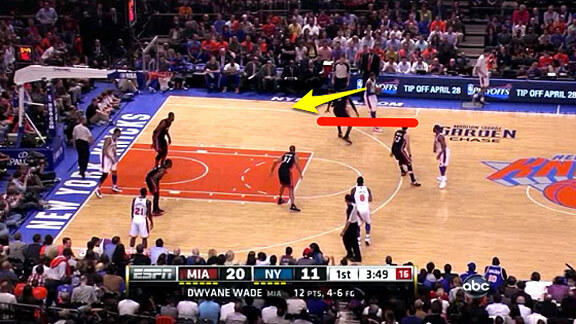 This defense relies on help, and that help should be coming from Bosh. As Anthony starts to drive, Bosh needs to range over and cut him off. Dwyane Wade is rotating to cover Bosh’s man — “helping the helper” — and he even points to the spot where Bosh should rotate to. 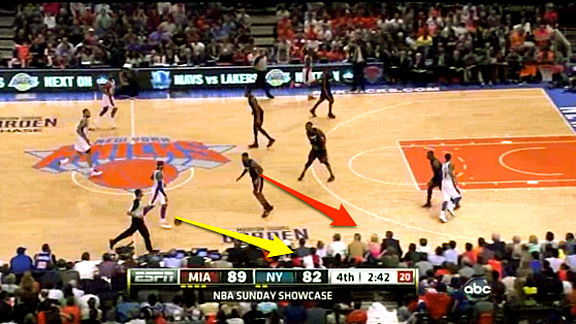 Instead, Bosh sticks with his man, who is so deep on the weakside baseline that he’s actually out of bounds. This is the danger of relying on rotations. When one guy messes up, the defense falls apart. James recognizes that the help isn’t coming, so instead of giving Anthony a layup, he takes the foul and sends him to the free throw line. 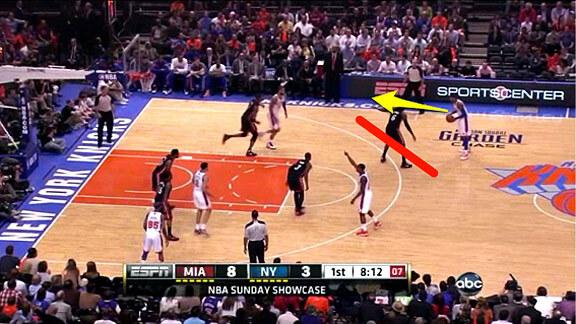 In nearly all of Anthony’s isolation possessions on Sunday, James or Battier forced him to the help. Unfortunately, the help rarely came, and when it did, it was late. 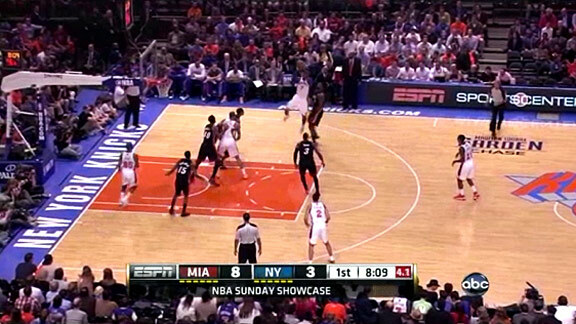 This helped Anthony light up the Heat for three quarters. So what changed in the fourth? 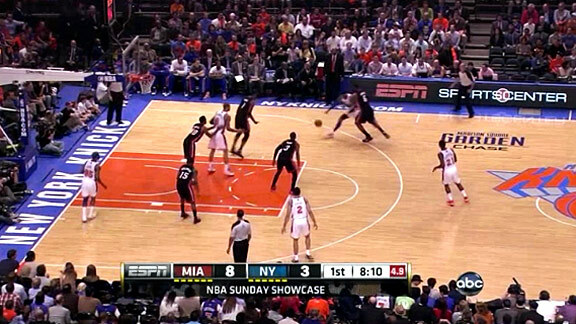 Miami started playing Anthony straight up, and Anthony started settling for jump shots. On this possession, James plays Anthony straight up, so when Anthony starts to drive baseline, James stays in front of him and stops his drive. When the Heat abandon the defensive scheme and allow James to play Anthony one-on-one, James beats him to the spot and forces him to cross over back to his left. Anthony ends up forcing a contested 3-pointer. Now, part of this is great defense by LeBron, but look at the shot clock. After his initial attempt to drive, Anthony doesn’t explore any other options. He just shoots a 3. On this possession, not only did James’s defense slow down Anthony, but Anthony also settled for a tough shot with 17 seconds left to find a better opportunity. James also made an effort to keep the ball out of Anthony’s hands in the fourth quarter. 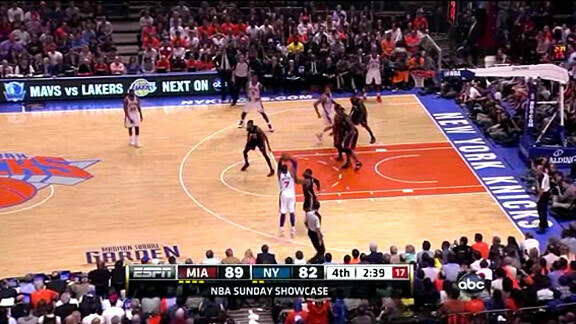 Here, J.R. Smith is trying to pass to Anthony at the elbow, but James fronts Anthony to make Smith’s pass more difficult. Smith dribbles to the wing to create a better angle for the pass, but James stays in front of Anthony. Meanwhile, time is melting off the shot clock. Eventually, Smith lobs the ball over James. Anthony catches the ball in the corner with five seconds left on the shot clock. Anthony shoots a contested 3 and misses. In the fourth quarter, Anthony had five isolation possessions and scored five points. On four of those possessions, Anthony shot three 3-pointers and a long 2. He made one of the 3s, but it was contested. Instead of forcing Anthony baseline, the Heat stayed in front of Anthony, prevented his drives, and let him shoot himself out of rhythm. Another factor in Anthony’s less-productive fourth quarter was the change in play calling. In the first three quarters, Anthony isolation plays started with other movement. For example, Anthony would set a back screen or get a pin-down screen, then pop out to the wing to catch the ball and go one-on-one. These simple actions like working off screens make it easier for Anthony to isolate. In the fourth quarter, that movement vanished. Instead, Anthony brought the ball up and just looked to score. That, or he just stood at the elbow and waited for a pass. That made Anthony’s job much more difficult. When Woodson was coach of the Atlanta Hawks, his team had a similar problem with the offense becoming stagnant late in games. If the Knicks and the Heat end up playing each other in the playoffs, it will be interesting to see how Miami coach Erik Spoelstra decides to defend Anthony. The help scheme he devised for Sunday’s game can work, but the team needs to execute it consistently. Spoelstra must decide if he wants to risk giving Anthony layups if the scheme breaks down, or if he just wants Miami’s wing defenders like James and Battier to guard Anthony straight up. For Woodson’s Knicks, isolation is their game, and they will probably ride that in the playoffs. But to be more effective late in games they must initiate the isolation offense with screens and ball movement. If they just let Anthony stand at the elbow and wait for the basketball to go one-on-five, they won’t stand a chance against Miami or any of their other likely first-round playoff opponents.